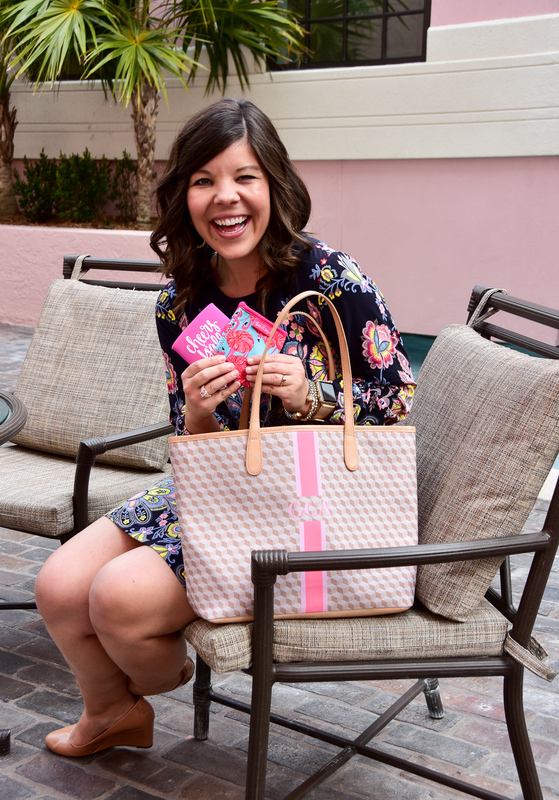 Breaking down the pros and cons of the popular Barrington Gifts Savannah Tote and showing what’s in my bag. I love how vocal y’all are when you love something or want to know more! That’s how today’s post came to life. I recently have been posting with my new Barrington Gifts Savannah Tote & I have never gotten more feedback from y’all than anything else I’ve ever posted!! I took my bag to AmericasMart with me and women were stopping me in the halls to get more details! 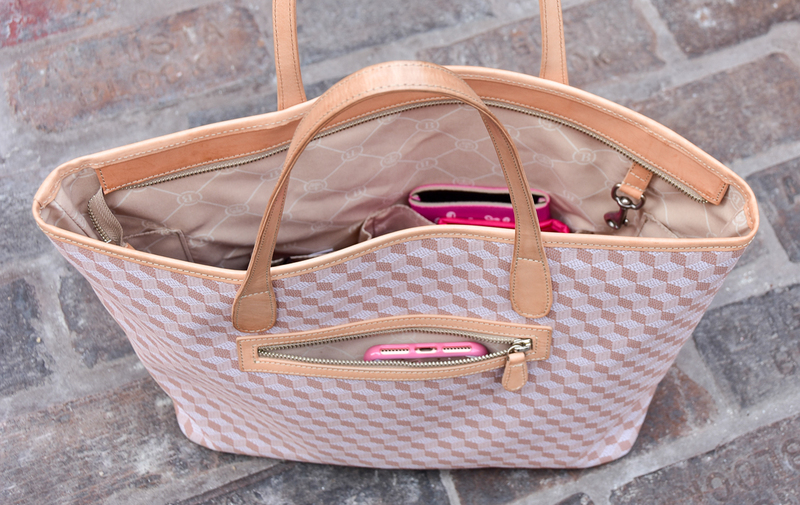 So many of you told me how much you love it and/or wanted more details about the brand & how to get your perfect bag. So that’s what today is all about!! 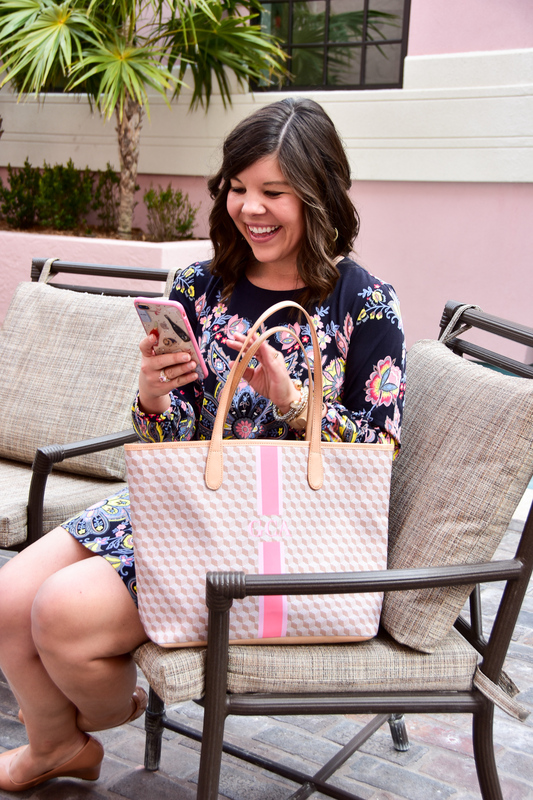 I’m going to walk you through what I love about Barrington Gifts, why I chose the Savannah Tote, & how to make your custom design! It is super easy to create a totally custom bag- the hardest part is picking your design and colors since they are all so cute! (I could spend HOURS on the site!) First things first, head over to Barrington Gifts and pick which bag or piece you want to make- you will also choose whether you want the classic leather patch or the momogram stripe (that’s what I have). Once on the landing page for your selected bag you will pick you design/color scheme (for instance my pattern comes in three colors). Then, you pick your stripe – again there are TONS of options so take sometime to play around and see what you like best! Next you will choose the design of your stripe, your monogram style, and your finishing leather trim colors (mine is the lightest option). Then VOILA! The most gorgeous custom bag will be sent off and created just for you!! Wallet– I’ve had this wallet for at least 5 years and it is my ride or die. The quality is outstanding (other than the cupcake I once dropped on it it looks good as new) and it has held up so well over the years! It’s got tons of room & organization. Keychain (c/o)- I just got this brand new key chain ring, and though it sounds dramatic to say it’s changed my life… IT’S CHANGED MY LIFE! Prior to this I had a gigantic key ring with about 25496556 random keys on it. One I got this keyring I simplified down to the 4 keys/cards I actually use and boom- instant organization! I also love that this oversize ring lets you find your keys super easily in your bag! Koozies- This is probably the item(s) I get teased for the most- but I can’t tell you how often I use them! I always joke that “you never know when a tailgate or party will erupt” but truthfully I just hate condensation or cold bottles in my hand so I use my koozies all the time! If you’ve been considering a Barrington Bag I hope that this post was so helpful for you; I think you can easily see how much I love mine & highly recommend it! You will have to let me know if you order one, and share this post with your Valentine if you’d like to unwrap one on the 14th! 🙂 Be sure to tag me on Instagram once yours comes in – I’d love to see what you design! 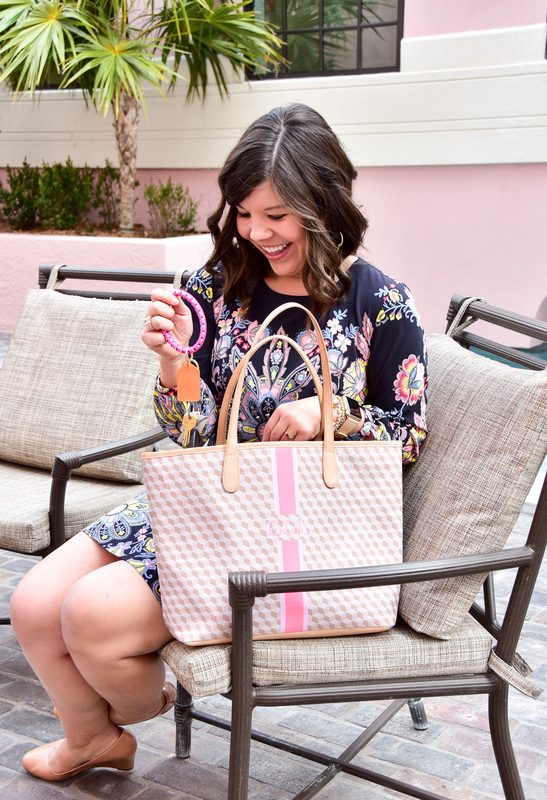 I love the cute, feminine look of this bag – I’ve shopped for Barrington Gifts before for work, and I’ve only really looked at their plain leather offerings before. I think you’ll love adding some of the colorful pieces into your rotation too! It’s soooo cute Gentry! I don’t have a Barrington bag yet but would love one! The design you chose is so cute! I always keep koozies in my purse too – you never know when you might need one! I love playing with the customization tool!! I’ve designed several bags but I haven’t bought one…yet! I love the colors you chose, and thanks for showing the inside too! What a lovely tote! Such a great carry all! 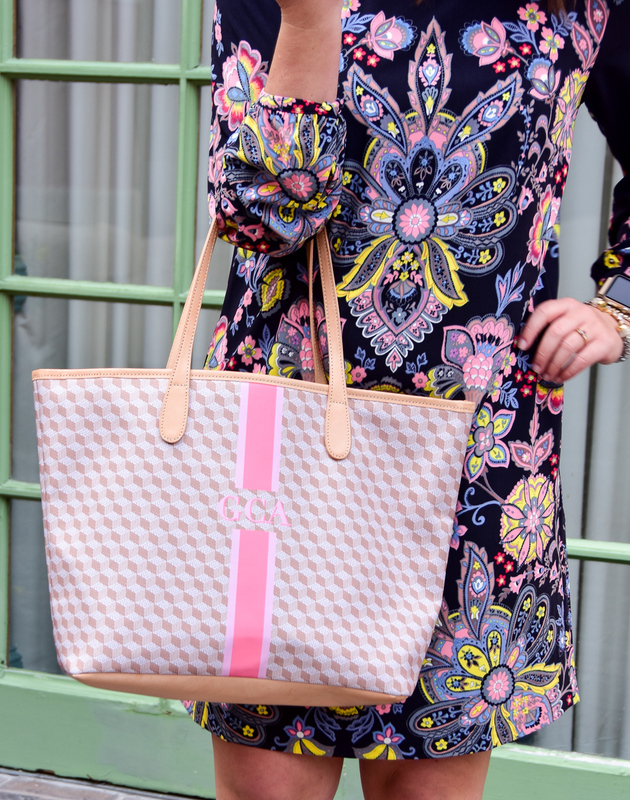 I love the way that Barrington allows you to customize the perfect tote! 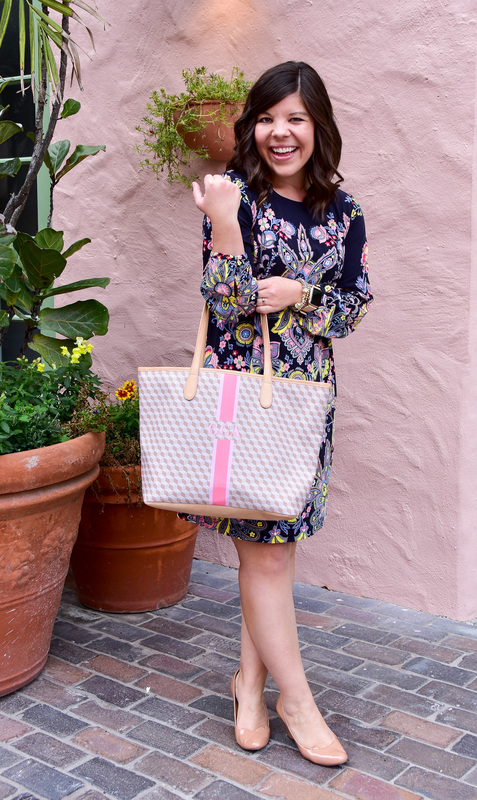 The pattern on this one is so cute, and it really is a versatile bag. Whitney has 2 and she love them both! The customization is definitely my favorite part of the process- then your bag is totally unique! Oh my goodness, I want that bag!! Lovely post and you look beautiful! I would have never thought to keep a koozie in my bag! I don’t like the cold feeling in my hand either I need to grab one. 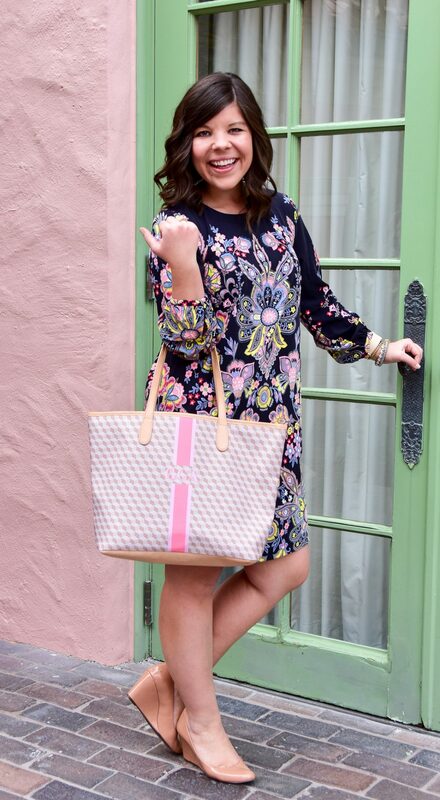 Your bag is so cute and I love how large it is! Oh, your entire outfit is so cute! Love the photos and the photo location too! 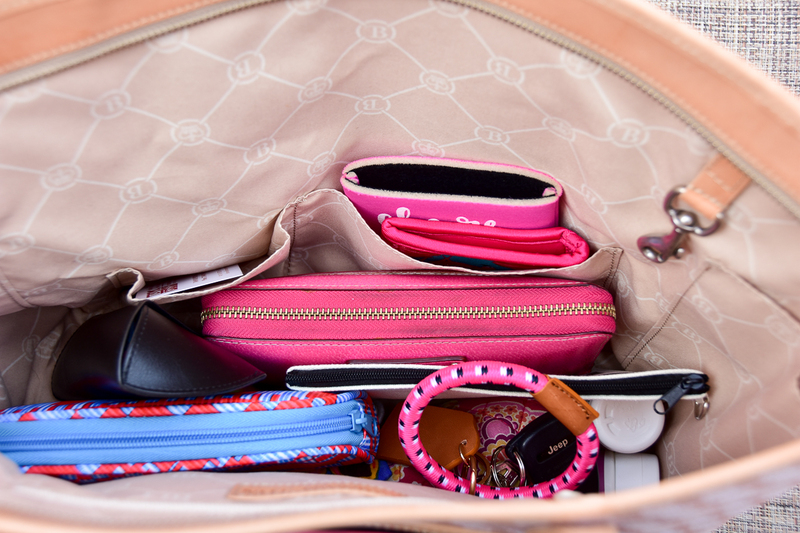 I love the colors of your bag and the size (and zipper) is perfect! Now that’s a cute bag! Love the size, it’s perfect. Also, cute dress you got there too dear! So colourful, so you and just fabulous! 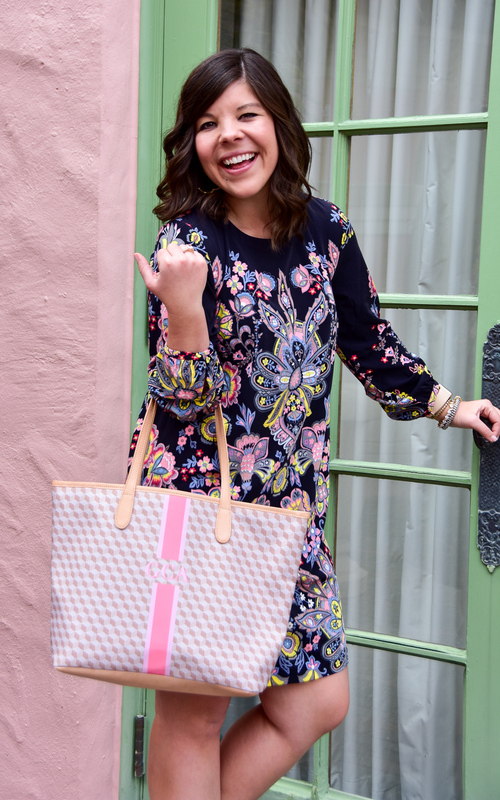 Enjoy these new bag designs that will surely fit any occasion! These are beautifully embroidered by our talented Filipino artisans. Made well by to ensure its durability. Check them out! 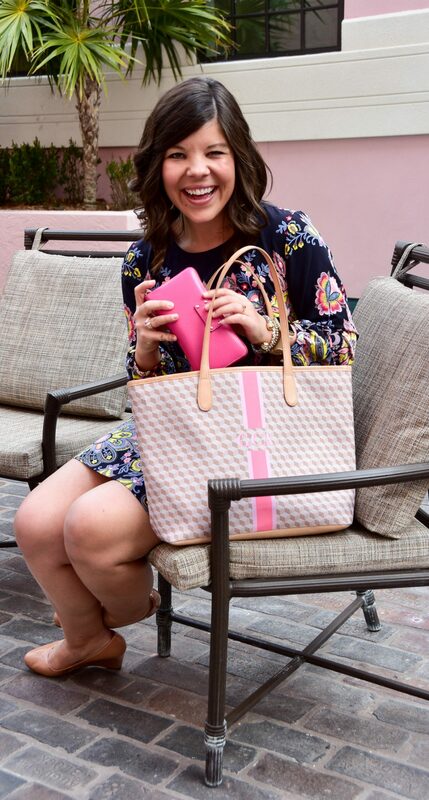 I would like to get my daughter a bag for her college graduation. She will be teaching. Which bag would you recommend for her daily bag to include carrying a laptop too? Thanks! Hi, what is the name of the pattern of your bag? Hi Carmen! The pattern is “Stone Geometric” 🙂 I love it and that it can transition from fall to spring!